Z-Ultimate Self Defense Studios is proud of our commitment in helping our students realize the powerful rewards of martial arts training and achieving their personal best through our Ultimate Kenpo system. Most martial arts styles or systems have their roots or main focus of instruction on one of these aspects; some styles may focus on two. It is very rare that find a martial arts style or system that focuses on all three aspects. One of the things that makes the Ultimate Kenpo system unique – and it is one of the main things that separates our methodology of teaching martial arts from other systems or schools – is our focus and combination of the CLASSICAL – PRACTICAL – TACTICAL aspects of training. By focusing on CPT, Z-Ultimate provides the best blend of the classical aspects of the martial arts, combined with practical and tactical applications, preparing the student to be able to understand, perform and apply their techniques to whatever self defense situation that may arise. A strictly “Classical” style will focus solely on traditional forms (also called katas) and basic movements; blocking, striking, kicking and footwork. There will be limited sparring – if at all – and very little focus on tactical situations. (A tactical situation being something like what to do when seated in your car and someone reaches through your window to punch you). An example would be a style like Tai-chi or other “internal” martial arts systems. Our classical methods approach (think body, or physical) is rooted in the traditional training methods (basics, drills, body conditioning and strengthening exercises), techniques, and forms which constitute the core of our Ultimate Kenpo system. With focused actions of repetition and memorization, the goal is to develop the powerful and explosive body ideally gained from martial arts training. With this continued martial arts training, we develop the skills of timing, gauging, footwork, and recognition of attacks necessary for self-defense. As with any new skill, especially physical skills, it takes a tremendous amount of dedicated practice to overcome our natural reactions (like flinching from a punch) and develop the new habit or proper response (like block, check, or avoid a punch). The continuous training of techniques (with a partner) forms hard wiring, or ingrains in us the proper responses and body movements for any given situation. The goal of the classical training is to develop our newly learned and trained responses and make them NEW REACTIONARY SKILLS. The classical training method continues to be used even through Master Levels of Black Belt in maintaining razor sharp skills. A “Practical” style or system usually doesn’t have “Classical” traditional forms or techniques. The focus is on techniques and constant drilling over and over of those techniques and constant sparring. There is usually no time dedicated to tactical situations or “reality-based” scenarios, with things like eye gouging, hair-pulling and more. Examples of these styles are boxing, wrestling, Bruce Lee’s Jeet Kun Do and mixed martial arts. Our Practical Method (think Mind) moves our training beyond the classical techniques and classical attacks to more realistic attacks and how the student should adjust the techniques accordingly. It’s during these Practical Training sessions that the student begins to understand the “how, why, and what if’s” of their material and how to make it work for them. The emphasis is learning practical applications of traditional techniques and forms, and drilling them! A great benefit (and joy) of our practical training methods is that students begin to experience the “Ah – ha!” moments of the martial arts and are able to intellectualize the “how’s and why’s” of the applications of techniques and forms. The student begins to understand some of the secrets, mysteries, and treasures of the arts, all of which come with skill and understanding. A word of caution: Do not confuse understanding of a technique or how to make it work with actually possessing the skill to use it. Once you’ve learned the practical applications of your techniques, it is time to classically train those practical applications and develop those NEW ENHANCED REACTIONARY SKILLS! We are taught new material not to have more technique, but to understand, investigate, develop and use it. 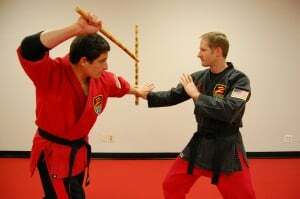 A tactical martial art style is focused on reality-based life and death scenarios.There are no “Classical” forms or training methods; there is limited sparring and much more focus on weapons training and defense. Examples of this sort of style or training would be military and law enforcement training and a style like Krav Maga. Our Tactical Method (think SPIRIT) is the essence of self-defense training. The student utilizes their martial arts skills gained from the Classical and Practical Methods in the Tactical training exercises of free style drills and sparring, both empty handed and with weapons. The purpose of the these tactical exercises is to develop an understanding of what the student is capable of, what works for them, and what areas in their training need improvement in case of a real life situation or simply for skill achievement associated with rank. Special emphasis is placed on developing the proper attitude and presence (SPIRIT) that’s needed for a tactical situation. The old saying, “It’s not the size of the dog in the fight. It’s the size of the fight in the dog.” is very true in the context of a self defense situation. Another way that we like to put it is that no one wants to fight, but you must have the willingness to do so if necessary, and you must have the proper mindset to prevail. Once again, continued drilling and training of developing tactical skills is what enables the student to achieve great levels of martial arts and self-defense ability and skill. We at Z-Ultimate believe that ALL martial arts styles have their strengths and no one style, one method, one technique or one anything is the answer. We believe the power is in combining the best of each of the Classical – Practical – Tactical aspects of self defense training into the most useful, practical, well-rounded system possible. In becoming an accomplished martial artist, one recognizes that the Classical, Practical, and Tactical Training Methods are interrelated, working together to produce the ultimate martial artist for each individual. Each training method can be performed individually to develop skill; however the cumulative effect of all three is what creates Z-Ultimate Student – one strong in BODY, MIND AND SPIRIT.